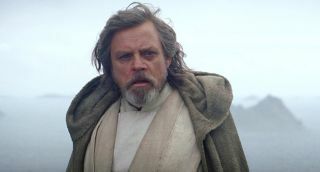 Star Wars 8 might be over a year away (and details are closely-guarded) but that hasn’t stopped leaks from happening, including one of the most hotly-anticipated reveals – what Luke Skywalker has to say to Rey. Possible spoilers follow so if you don’t want a look at Luke’s leaked lines (try saying that really fast) then try to force yourself away from the page. You’re still here, aren’t you? The force isn’t strong with this one. International Business Times reports on a video by Mike Zeroh that potentially reveals one of the first lines spoken by Luke Skywalker to Rey in Episode 8. The line is also rumoured to be spoken during the first trailer for the movie, which is expected to hit in the first few months of 2017. Come on, Luke! Talk about ambiguous. Let’s dig down into it: This could mean Rey is the key to unlocking a forgotten power or, more likely, it could could mean a rebirth of the Jedi Order – with Rey at the helm. Either way, Rey will be at the centre of all things Force-related for quite some time. It should be repeated that it hasn’t been officially confirmed but Mike Zeroh has received this information from four different sources and it does kinda sound like something a mentor would say to a Jedi-in-training to pump them up. It’s not quite Rocky running up those steps, is it? As for that trailer, we’ll find out soon enough but this information is enough to tide us over for a while – unless the Star Wars producers bump off Mark Hamill for revealing secrets.